Modern hard disks are set to automatically enter sleep mode (also known as idle time) whenever file operations are no longer happening. This is a method that helps with cooling the physical disk and prolonging its lifespan. However, if you wish to prevent this from happening, for example if you want the disk to quickly respond to file operations even after remaining idle for longs periods of time, then you can tinker with the built-in settings of your machine to turn off HDD sleep mode. If you find this method to be tedious, though, then you can turn to software utilities capable of keeping the HDD awake by creating small-sized files just to be able to mimic user interaction. Such a program is Prevent Disk Sleep. Designed with the casual user in mind, Prevent Disk Sleep is incredibly simple to use. It can be scheduled to create a plain text document (TXT) in any disk of your choice, whether it's local or external. After a speedy installation that requires minimal intervention, the tool opens a plain window which shows all options available. Once you identify the disks you wish to prevent from sleeping, it's necessary to pick the matching drive letters from a menu, set the disk write interval (in seconds, minimum is 10 seconds), edit the name of the TXT doc that will be created, as well as click the 'Start' button. The first step is creating the text document with the given name. It's placed right in the root of the selected disk, so it shouldn't be difficult to track down. 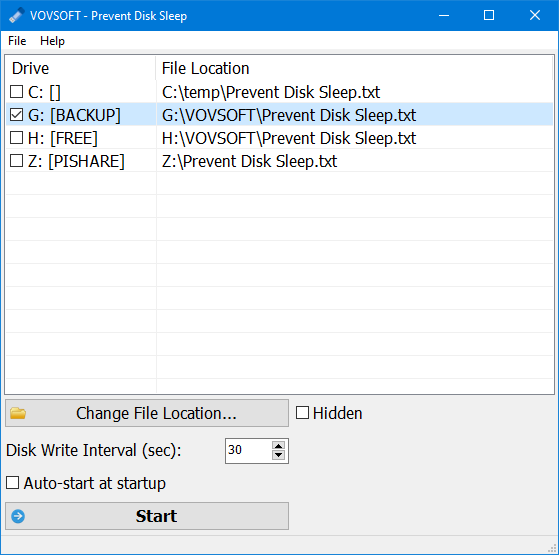 Prevent Disk Sleep doesn't create multiple files each time it writes to the disk. Instead, it updates the one document by adding date and time stamps. This is also helpful for logging its activity and finding out the exact time of each disk write. Whenever you want to disable Prevent Disk Sleep, simply stop the operation after returning to the main app window. This page was last modified on 22 February 2019, at 10:04.